Talk of problem-solving and the name that pops to mind is Ritu Chaudhry – my true blue friend. Whether you are faced with an onslaught of guests, or your domestic helper’s absence from work or are upset with something your spouse said, or, worse still, find that you and your incorrigible teenager are on a warpath, trust Ritu to help you find some quick answers and peace. Sometimes, she may not say anything right away, but sooner or later, within a day at the most, she will revert with some brilliant insights. Very often, they are the simplest of answers but it takes a friend like Ritu to find them for you. On one such occassion, a tired Thursday morning, when I was having house guests for more than a week, I called her for a quick recipe that would serve as a substantial breakfast rather than embarking on the usual idli-chutney-sambar combo. In her characteristic drawl she asked me what I had in the fridge? I said nothing other than orange juice and fresh peas. She said – no problem, add them to beaten rice (Poha). I thought she was joking, but she went on to share the recipe of orange poha – a vegetarian snack that is full of surprise, taste and spontaneity! Thanks to Chithraji Viswanathan for trying this recipe yesterday and inspiring me to post this today. I have simply been procrastinating. A dish that is rich because of its subtle taste. Best eaten by itself. The above pic was taken in Birmingham where I had gone to visit my daughter Manas in 2009. She loves this dish and it was the first thing she asked me to make when I landed there. This pic also features Aate ka Sheera, a favourite sweet dish she learnt from her grandma. To tweak this into a Jain recipe, avoid the ginger. Traditionally, Jain food does not contain any of the root vegetables. 1) Pound the ginger and green chillies. 2) Rinse the beaten rice just once, but gently and thoroughly. Squeeze out the water. Now sprinkle the orange juice, 1 tbsp at a time, every few minutes. Set aside for 15-20 minutes until it absorbs the juice well and becomes fluffy. 3) In a wok, heat oil for tempering. Pop the mustard, reduce flame and add the asafoetida and curry leaves. 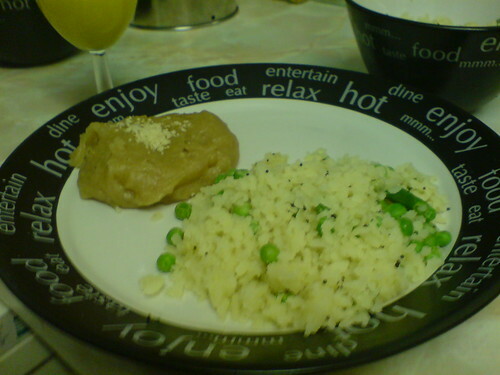 4) Add the green peas, pounded chilli-ginger onions and sauté for a couple of minutes. Add the beaten rice and remaining ingredients and stir gently until well combined. 5) Switch off flame and garnish with the chopped coriander leaves. Serve fresh for breakfast or as a light dinner. Click to view many more such tributes to special friendships. Please share your special recipes or tributes to wonderful friendships in the form below.